We do, which is why we believe that these bright, bold, attractive magnets will draw all the good things in life into your world. Each magnet has been designed with a different purpose in mind and can be attached to a wide range of surfaces, meaning that you can remind yourself of all the good things in your life throughout the day. 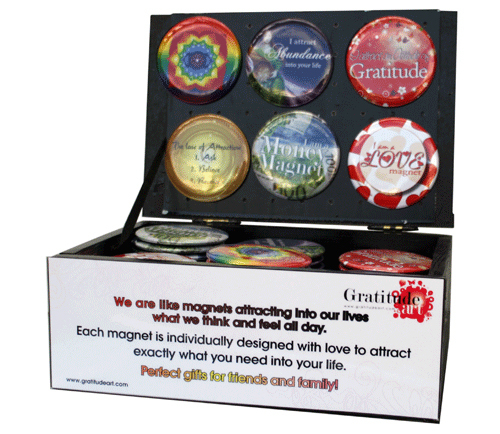 There are so many things for which we should give thanks every day, but sometimes we need a few reminders and these vibrant magnets are a fun way of persuading us to adopt an attitude of Gratitude. We are all magnets, unwittingly attracting both the positive and the negative. These magnets are visible reminders of the importance of focusing on life’s happier aspects so that we can benefit from an increase in the good things in life. Whether you prefer to attach them to your fridge or keep them in your bedroom for inspiration on waking, these magnets have a positive message for every occasion.